'Office politics' at the charity shop have been getting to me lately. I can't believe so much bad behaviour goes on over a pile of tatty junk! The problem seems to be the equal status managers. Neither has the final say on matters so they just do what they like regardless of the need for teamwork. I'm very often in the middle of their spats being the only volunteer who goes in for more than one afternoon a week. After yet more stress and moaning and having to be a party to undoing one manager's work in favour of another's I decided the time was right to reduce my volunteer contribution and also have a few days off. In the last week I've been able to leave the confines of our locality and join M on some work excursions. His work is spread far and wide and in the space of seven days he's been as far North as Skipton and as far South as Oxford. Both were lovely days out for me despite the long journeys. Court work is often quicker than the amount of time M is booked for so I tend to prioritise my time when I arrive in a strange town. I was last in Skipton about 15 years ago so naturally I googled wool shops and headed straight for Purl and Jane. It was wonderful, right up my street. I fell in love with the gorgeous display of natural baby garments all designed by Jane. The pattern book was an 'investment' shall we say. All are knitting patterns rather than crochet but from baby up to ten years old in simple stitches so nothing too large and difficult. I figured my new nephew or niece will be well catered for with this collection. Jane was lovely and helped with a couple of wool requests. I could have spent the day in there choosing and a small fortune but I came away with wool for two projects that will be fairly quick and easy and needed sooner rather than later. There's evidence that I encouraged J's fine motor skills from an early age too. A home video of him casually cutting shapes from paper at the age of two. My Dad says, 'you haven't got those sharp scissors have you Jake?' to which a wide eyed innocent J says, 'No Grangrad' (I spelled that how he used to say it). The scissors meanwhile have been deftly moved from table level to lap but move back again when Dad turns away to help Ella (five years old by now) with paint. Little rascal. I'm proud to be the chief craft person when it comes to friends with primary school age children. I get invited for coffee and end up helping them with homework collages. 'Help I don't even know what a collage is, but I suspect it involves glue, aaaargh!' Really? Where were they when Blue Peter was on? Oh well, see what a trip down memory lane sets off? Back to crochet talk. 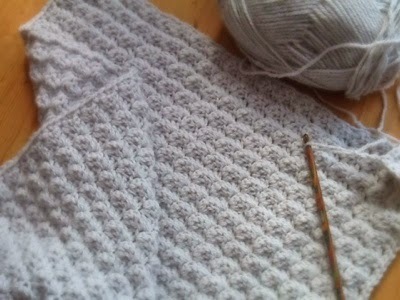 I've been going round and round the edges of this pale grey and very soft baby blanket. 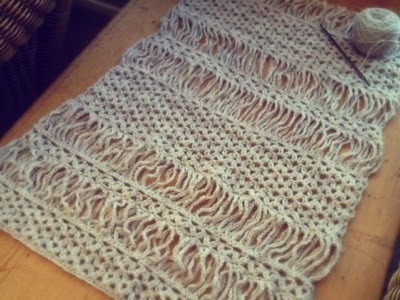 It looks plain so far but I can't wait to add the splash of contrast colour to the border. I've hit a slight snag with the driftwood shawl and the yarn won't hold up to being frogged so I need to pick up a few clusters somewhere and keep going. It's so rustic I don't think it will particularly show in the final thing. Of course, I will know the error is there but it's not the end of the world. I should have counted between sections. With all these wips getting daily attention there should be some finished projects soon!